All-time high employment: should you be impressed by 1.9 million? There are a record number of people in work in the UK. There are about 1.9 million more people in work than in the three months prior to the election. 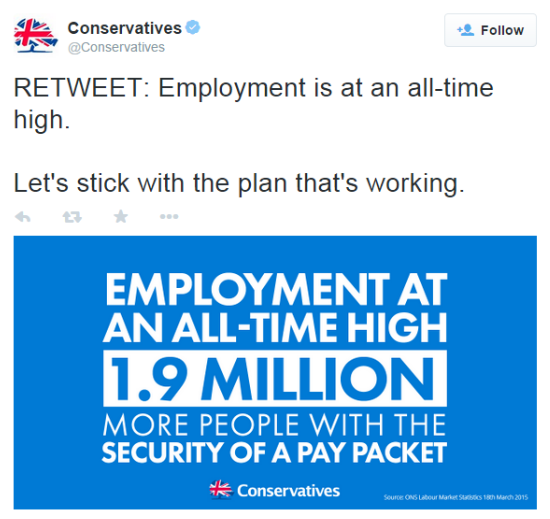 This much is right about the claim from the Conservatives—versions of which we've seen before—according to the latest figures. 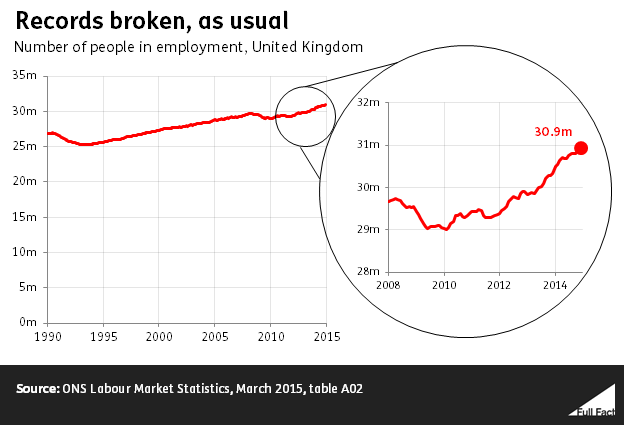 It's also uninteresting, partly because there are a record number of people, and partly because the records on employment are constantly broken, bar periods of economic downturn. So we shouldn't use the employment level. Look at the employment rate—the proportion of people aged 16-64—and you do get a story: before the downturn in 2008 a peak of 73% of us were in work. That got as low as 70%, and is now back up beyond 73%. That's a record level on a more meaningful measure. Of course it's reasonable to use the headline employment rate, but this measure isn't ideal either. This is because the headline measure of employment actually includes some women who are already claiming their pensions. It includes everyone aged 16-64 but the State Pension Age (SPA) for men and women isn't equal yet. This changes a few things, mainly producing a lower rate. 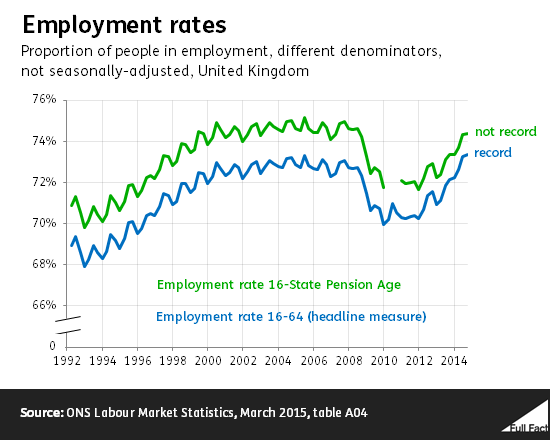 The ONS also measures employment based purely on people below the State Pension Age—with different age groups for men and women. On this measure, we're not at record levels yet, as has been pointed out before (although these figures aren't quite as up-to-date as the normal, headline measures). The broad picture is still that we've recovered to pre-downturn rates, but not quite the peaks of the 'boom years' before. Has there been a sharp rise in in-work Housing Benefit claims? Are spouses living abroad pocketing millions in UK pensions? Does means-testing pensioners make financial sense?